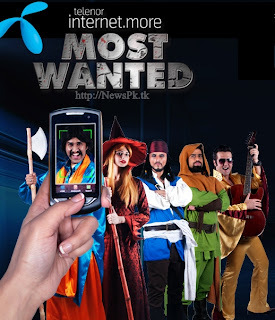 Telenor Pakistan brings Most Wanted Contest under telenor's brand name internet.more. Most Wanted Contest is based on the characters, escaped from the internet ;-), and roaming in various cities of Pakistan. How to participate in the Telenor Most Wanted Contest ? Catch them in three simple steps and win exclusive Prizes via Telenor Most Wanted Contest. How to signup for most wanted album.